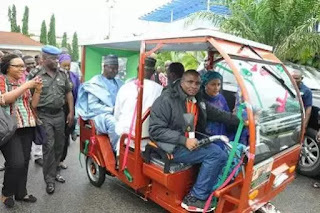 The CEO Arthur Energy Technology Limited, Arthur Anthony Okeyika drives the FIRST SOLAR POWERED TRICYCLE assembled in Nigeria by Arthur Energy Technology Limited. Also beside him is The Hon. 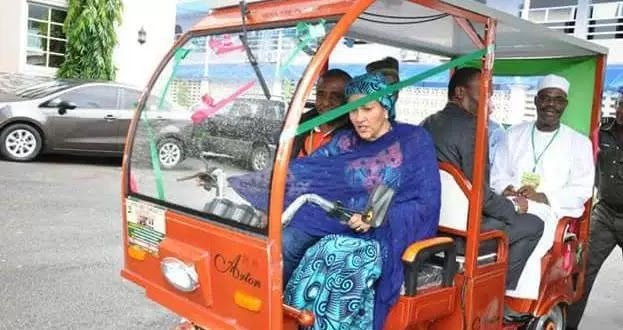 Minister, Federal Ministry of Environment Amina J. Mohammed, and inside the Tricycle we also have ,the Hon. Minister of State Federal Ministry of Environment, Ibrahim Usnam Jibril, Hon. Minister for Niger Delta and Permanent Secretary, Federal Ministry of Environment Dr Bukar. The Hon. 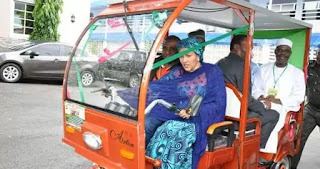 Minister, Federal Ministry of Environment Amina J. Mohammed, had a test drive on the 19th day of August 2016 at the end of the 10th National Council on Environment held in Lafia, Nasarawa State Nigeria.